Kobbari (Coconut) Bobbatlu are one of the popular dish. It is also called as Kobbari Bhakshalu or poli .It is mostly prepared during Festivals . Its very delicious ,healthy ,tasty and easy to prepare. 1) In a mixing bowl add maida,wheat flour, oil and salt and make a dough by adding enough water slowly.Add it only as needed. 2) Make a very soft, pilable dough. Knead very well.Lightly coat with oil.Cover and Keep aside.Let dough rest atleast for1 hour. 1) In a thick bottom pan or non stick pan heat 2tsps of ghee on medium heat . 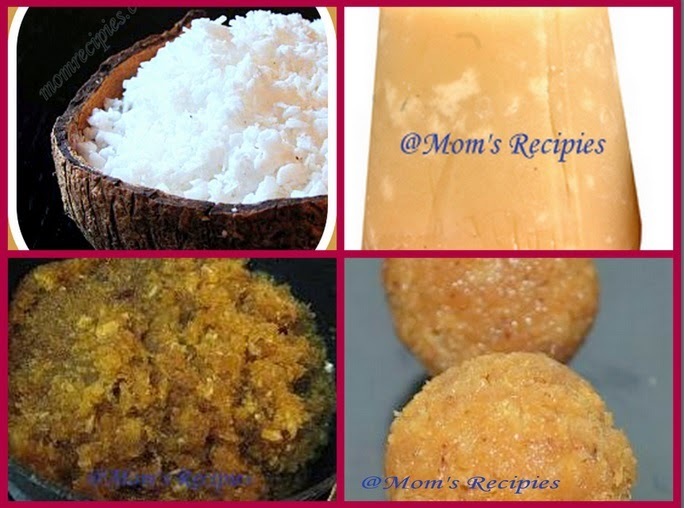 3) In few minutes jaggery will start melting, Allow coconut to cook well in the jaggery syrup. 4) Stir continuously so that it does not stick to the bottom. 5) Cook until the mixture comes close or becomes thick or leave the sides of the pan. 6) Do not overcook otherwise the the mixture becomes hard. 7) Add the cardamom powder and mix well. 8) Turn off the heat and keep it aside for few minutes. 9) Let the mixture cool. This is the bobbatu filling. 1) Divide the dough into equal portions, roughly the size of a golf ball. 2) Roll a ball with the help of a little whole wheat flour into a small circle to prevent the ball from sticking to the rolling surface. 3) Now spoon some of the coconut / Kobbari filling into the center of this circle. Fold the edges of the circle and pinch together to seal. 4)Flatten this new ball gently with your fingers and use a rolling pin and gentle, circular pressure to roll it like chapati. 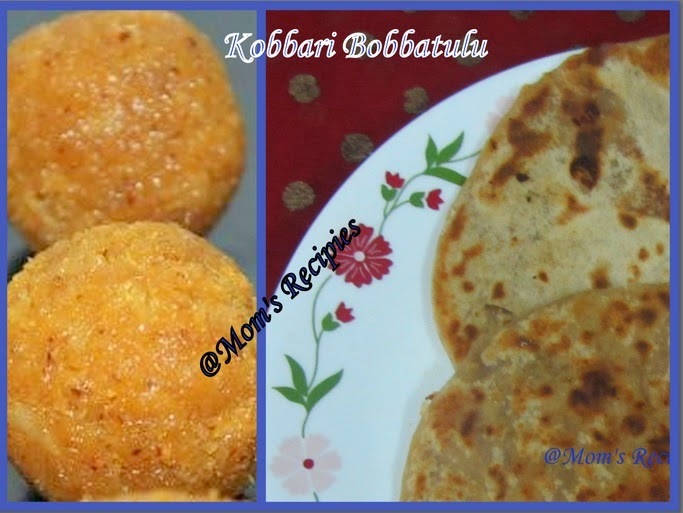 5)Do this with all the dough and coconut /Kobbari filling. 6) This can get very tricky as the filling does try to slide out. Use a little flour if that happens. Roll. 7) Roast each poli / bobbattu on a hot girdle with ghee. Roast both sides till well done and aromatic and it gets golden brown color. 8) Smear with ghee on both sides when done. 9) Serve hot /cold .